Have you always wanted to go fishing but don’t know how? Join us this summer for the Learn to Fish program at Heart Lake Conservation Area. This is a great opportunity to learn everything you need to know to have a safe and fun fishing experience. Toronto and Region Conservation Authority (TRCA) prides itself on offering limitless opportunities for people to get out into nature – for fun, for exercise, for family time and for greater well-being of body, mind and spirit. That’s why TRCA encourages enjoying our greenspaces, parks and conservation areas in a variety of ways, and fishing is yet another activity that brings people out into nature. In partnership with the Ministry of Natural Resources and Forestry (MNRF) the Learn to Fish program, teaches people the art of angling in a way that aligns with conservation ideals. Instructors outline equipment and how to use it properly, and impart the lessons of sustainable fishing through the practice of catch-and-release. This approach allows for the enjoyment of fishing, while at the same time maintaining the goal of conservation and protection of fish populations. Learn to Fish classes are offered throughout the summer at Heart Lake Conservation Area (10818 Heart Lake Road, Brampton). Two sessions will be offered each day from Friday – Sunday (10 am – 12pm; 2 pm – 4pm). NEW this year. We will be offering groups sessions on Wednesdays and Thursdays throughout the summer. A minimum requirement of 15 people (including adult supervision) must be met to book one of these sessions and must be done a minimum of 48 hours in advance. To book a group for a session, please contact Joanna Gardner at jgardner@trca.on.ca. To register for general public sessions, please click on the link below. Classes are free, but fill up fast. Please note that while the sessions are free to participate in, admission fees to the conservation area do apply. For more information please contact Joanna Gardner at jgardner@trca.on.ca. Please use the link for the month in which you are most interested in participating. Learn more about the Flood Monitoring Program. 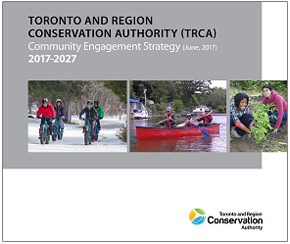 How does TRCA's Community Engagement Strategy guide our work with residents?